Whenever I have to begin a new illustration, I’m always afraid to start. I hem and I haw and I haw and I hem. Why? 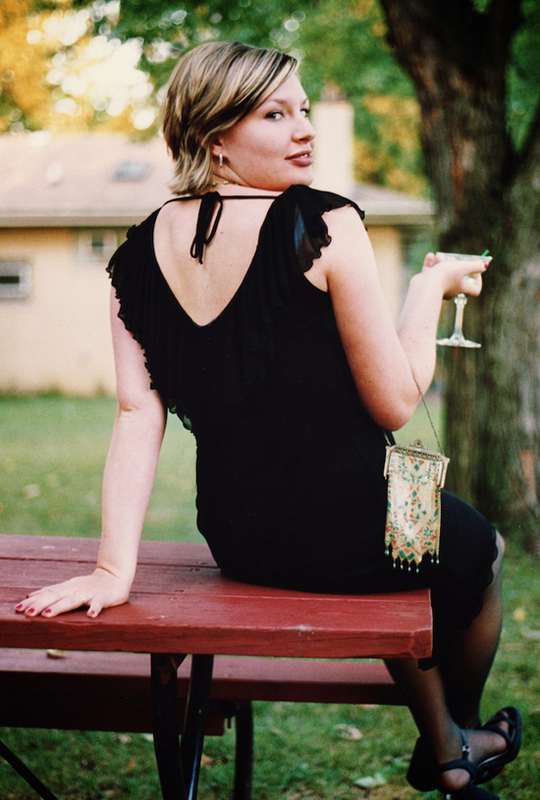 Because there is no earthly reason that I’m capable of bringing forth that kind of beauty. In my mind, the images are always vague. I want them to be in perfect focus before I get going. But it doesn’t work that way. Until I learned the meaning of the phrase Sunrise Faith, I could stay paralyzed for weeks. It never occurred to me that the same power that calls the sun to rise, lives in me too. The magic begins when I put my pencil to paper. That act of trust opens the floodgate for Spirit to flow through and express itself. As it turns out, I don’t need to know exactly what the end result of my painting will look like. God will fill in the details. 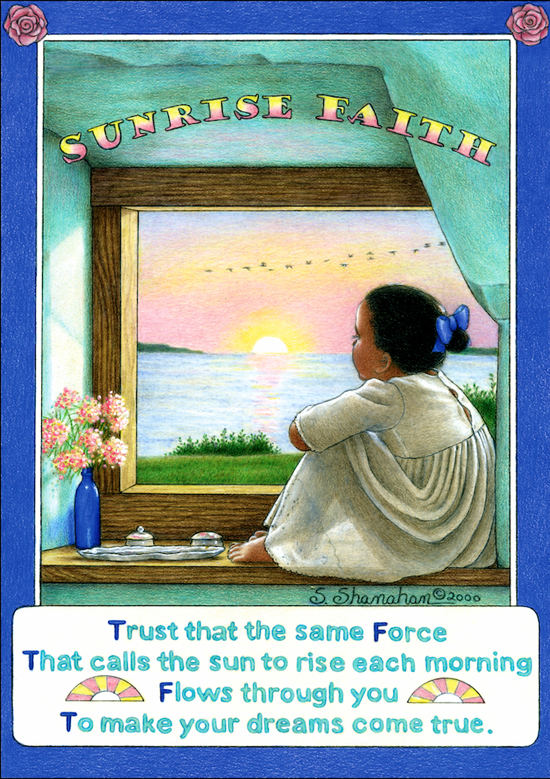 Sunrise Faith is a concept for anyone who has something they want to accomplish. Divinity plants the seeds of our aspirations in our hearts and grace brings them to fruition. From creating a masterpiece, to finding the perfect job or house, it’s a benevolent, loving wave we ride. If you’re trying to figure out exactly where the current is taking you, you’re resisting the flow. And that is exactly when we begin to sink. All we need to get started is to simply begin. We will be given the next step to take as the process unfolds. Twenty years ago a dream was planted in my heart. I wanted to create a picture book. Over time, it was put on the back burner as “real life” took over. Finally, finally my longing is being realized. My story Glory in the Morning is finished and is now in the hands of app company extraordinare, Auryn. They are in the process of transforming my work into a picture book app for tablets and e-readers. But my dream won’t be in full bloom until there also is a traditional picture book in children’s hands. I’m not sure how that is going to come about, but I wait in joyful anticipation for it to be revealed. 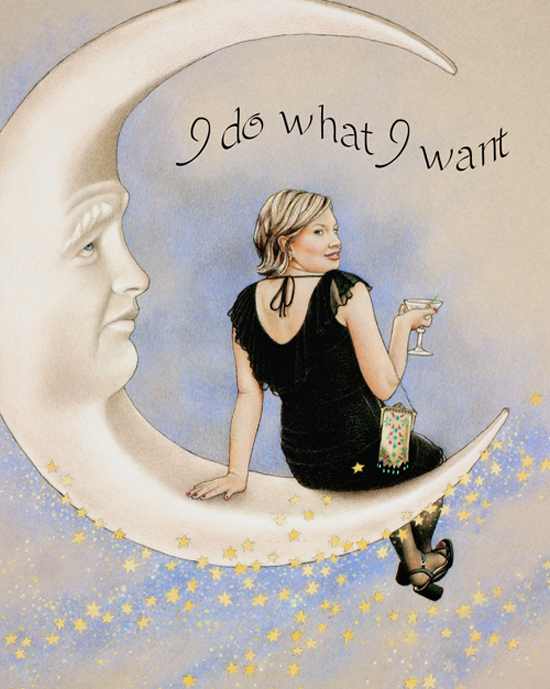 What dreams are you and Source bringing to fruition? Spread the word! Be one of the first 5 people to leave a reply and I will send you a signed print of Sunrise Faith. Follow my blog. Each new post will include the chance to win a free print. 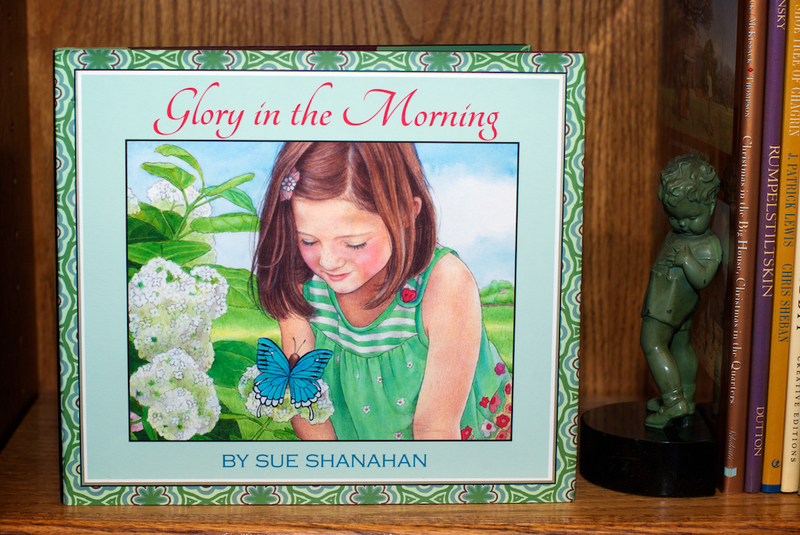 In photoshop I made a book cover for Glory in the Morning and placed it on a picture book. I believe visualization is the beginning of realizing a dream.